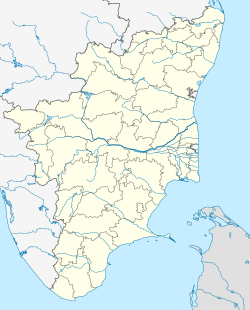 Thoothukudi, is a port city and a municipal corporation and an industrial city in Thoothukudi district in the Indian state of Tamil Nadu. The city lies in the Coromandel Coast of Bay of Bengal. Thoothukudi is the headquarters of Thoothukudi district. It is located about 590 kilometres (367 miles) south of Chennai and 190 kilometres (118 miles) northeast of Thiruvananthapuram (Trivandrum). According to Confederation of Indian Industry, Thoothukudi has the second highest Human Development Index in Tamil Nadu next to Chennai. Tuticorin City serves as the headquarters of Tamilnad Mercantile Bank Limited. Major educational establishments in the city include Thoothukudi Medical College, Fisheries College and Research Institute, Tamil Nadu Maritime Academy, V.O.C. Arts & Science College, Dr. Sivanthi Aditanar College of Engineering, Government Polytechnic College, and Anna University Tuticorin Campus.Tuticorin Port is one of the Fastest growing Major Ports in India. Tuticorin is an "Emerging Energy and Industrial hub of South India". This page was last edited on 21 April 2019, at 07:54 (UTC).